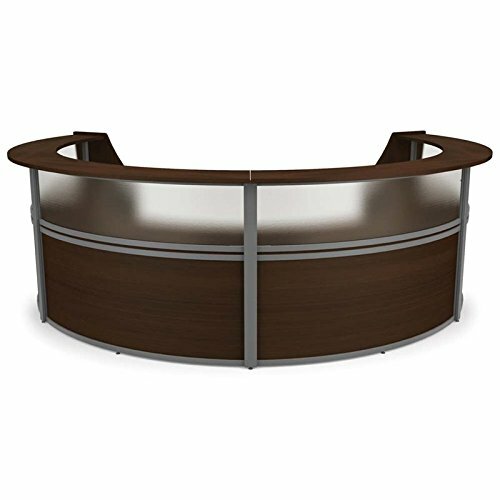 Satisfy clients, guests, receptionist and your budget with OFM's Marque Plexi Four-Unit Reception Station, Model 55314. This high-end designer look makes a great first impression while keeping your budget in mind. The durable construction features a powder-coated painted steel frame in silver finish (black finish is special order) and thermofused melamine finished with self edge. But it's not all about looks -- the convenient design keeps the user in mind. The top plexi panel allows light into the desk area, and there are wire management cutouts in the interior desk. Your maintenance crew will also be happy because no tools are required for assembly.